Office buildings, car dealerships, fast food restaurant and retail outlets line up for five kilometers on both sides of the road that leaves Frankfurt to the east. The Hanauer Landstrasse seems to have nothing to do with a historic route. Hidden between the intersection with a metropolitan freeway, railway tracks leading to the nearby harbor and a gray warehouse stands a piece of an old wall. This remnant of an old building not only is from a different era, it also feels completely out of place. With its back only very few meters away from the windowless warehouse, it is encroached by a car park on its front and overgrown with bushes. Having an active graffiti community in the area it is surprising that it is not decorated with some colorful calligraphy. Closer inspection of the pitiful ruin shows a plaque that explains some of the history and the connection to the Hanauer Landstrasse. The old wall is all that remained of the gatehouse of a large estate that stood here on the old road from Frankfurt to Hanau called Riederhof. In addition, this was the place where the road left the outer defensive system of the walled city of Frankfurt in medieval times. A system of dykes and thick brush ran around the city protecting a perimeter about three kilometers wide. This system called Landwehr, had watchtowers and controlled access points, of which the Riederhof was one. The arrow slits and small windows in the upper part of the remaining archway still echo this defensive function today. The estate buildings existed until the Second World War. After being damaged in a bombing raid, they were demolished leaving only the wall of the gatehouse and the name of the local tram stop to remember the history of this place. 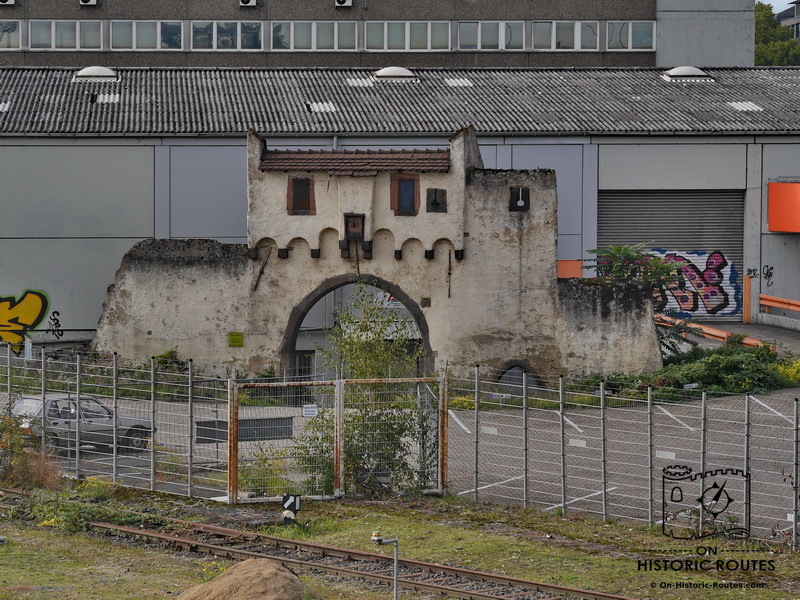 While the city defenses of Frankfurt have long lost their purpose and are reduced to few remnants, the Hanauer Landstrasse is still thriving. It attracted its first businesses and industries in the 19th century and today runs through some of the major industrial suburbs of Frankfurt.